The $1M PP LIVE Dollars Leaderboard concludes this week and Marty Mathis is on course to win $100K. partypoker launched its PP LIVE Dollars currency in January 2018 and celebrated the launch by creating a year-long leaderboard that pays out $1 million worth of PP LIVE Dollars. This promotion concludes on Apr. 15 and it is Marty Mathis who is on course to finish on top of the leaderboard and bank $100,000. PP LIVE Dollars is a special currency that is won online in partypoker satellites, then used to buy into any of the tournaments run by or in conjunction with partypoker LIVE. It is also possible to exchange PP LIVE Dollars for travel and accommodation expenses, giving live poker tournament players the ultimate in flexibility when it comes to choosing the events they want to play. The $1M PP LIVE Dollars Leaderboard pays out $1 million worth of the currency across the top 100 PP LIVE Dollars winners. One-hundredth place will receive $5,000 PP LIVE Dollars with the overall winner securing $100,000. Poker players have embraced the PP LIVE Dollars concept with partypoker LIVE informing PokerNews that 6,635 different players have won a share of $23,023,541 worth of PP LIVE Dollars to date. Mathis is one partypoker player who is a fan of the PP LIVE Dollars, not least because he used them to buy into the partypoker LIVE MILLIONS South America Main Event that he went on to win for a career-best score of $873,700. Mathis also finds himself at the top of the $1M PP LIVE Dollars Leaderboard having secured $389,050 worth of the flexible currency, although he has a handful of opponents hot on his tail. 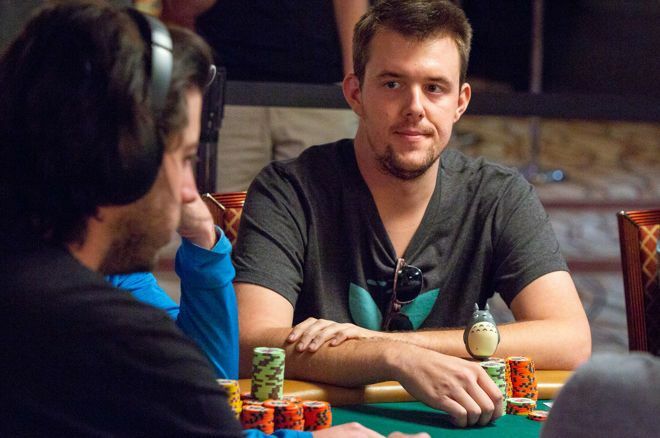 Mathis recently tweeted that he has been grinding PP LIVE Dollars satellites for 12-18 hours every day since his epic victory in Rio de Janeiro. Despite the huge grind, Mathis has found time to brush up on his satellite skills by purchasing and reading the recently published satellite poker strategy book released by Irish satellite specialist Dara O’Kearney and Barry Carter. This extra knowledge could turn out to be the difference between finishing on top of the leaderboard for $100,000 or dropping down to second or third-place where prizes of $80,250 and $62,000 await. Mathis may hold a $16,650 lead over second-placed “oi-oi-oi” but that lead isn’t as substantial as you might think because there are hundreds of thousands of PP LIVE Dollars guaranteed to be won every week at partypoker, including a $1,050 buy-in PP LIVE Mega Satellite on April 14 that has 10x $10,000 guaranteed! It is not only the race at the top that is going to be close as there are only a handful of PP LIVE Dollars separating many of the other places on the leaderboard. Currently, you need $48,700 to rank in the top 100 with 101st place sitting at $47,850 and one place below at $47,750. One final push from any of those players hanging around just outside the leaderboard could push them into the top 100 to secure a $5,000 prize. While it is definitely too late to mount a challenge for the top prize on the leaderboard if you are only just starting to grind the PP LIVE Dollars satellites, the value is still there as any PP LIVE Dollars won do not expire for 24 months. That means you have plenty of time to accumulate them and travel the world on the partypoker LIVE tour. Play PP LIVE Satellites today by downloading partypoker via PokerNews. Once you have created your account, deposit $10 to receive $20 worth of SPINS (jackpot sit & go) tickets, or at least $20 to receive $30 worth of SPINS tickets during the first six days after you first fund your account.